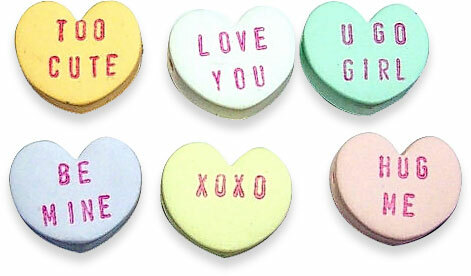 Nothing says Valentines Day to me more than old-fashioned conversation hearts. Arizona’s Barb Handy (barbiesbest) makes an exact copy in polymer that’s hard to resist. They’re perfectly simulated from the chalky colors to the pink ink to the typeface. Her charms are made 1/4″ thick and drilled either vertically or horizontally. Barb has it down perfectly. Thank you so much for sharing my hearts.